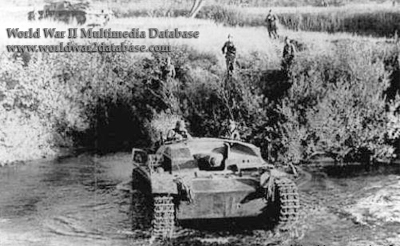 Sturmgeschutz III ausf B (SdKfz 142) fords a river. The thirty StuG III ausf A operational during the Battle of France were successful enough to make changes to the design. The ausf B had 400mm (15.7 inch) tracks and improved the suspension and transmission. The low velocity 75mm (3 inch) KwK 37 L/24 main gun was designed to attack fortifications. 320 StuG III ausf B were built between June 1940 and May 1941. They armed seven Sturmartillerie batteries and four Sturmartillerie Abteilung (Assault Artillery Battalions). The 2nd Sturmartillerie Abteilung fought with StuG III ausf B in Yugoslavia and Greece, and the 6th Sturmartillerie Abteilung fought in Operation Barbarossa, the invasion of the Soviet Union in June 1941.